What do you know about lemurs? Probably that they are animals, and that King Julien in the animated Madagascar movies was one of them. Beyond that, anything? Whether you do or not, but especially if you don't, the IMAX documentary Island of Lemurs: Madagascar should go on your watch list. The film, on Blu-Ray Combo Pack and Digital HD March 31, brings you face-to-face with these amazing creatures. It leaves you asking yourself, Why didn't I already know about this? Narrated by Morgan Freeman, the film takes viewers to Madagascar, the only place on earth where lemurs can be found. We learn how they arrived as castaways millions of years ago when a storm washed them to sea. They found their way back to a hospitable environment, where there seem to enjoy great happiness. We also meet Patricia Wright, a primatologist who helped lobby for a national park where they could live free and be studied with a minimum of disruption. She has an interest in making sure the more endangered varieties of lemurs survive. In a rather amusing bit, Wright brings some new lemurs into the park so that they can mate with a father and daughter, who are the only two left of their kind. It makes for some rocky romances, to say the least. Best of all, director David Douglas provides lots of footage of these delightful creatures dancing around. The way they move is so joyously goofy that it will bring a smile to your face. The Blu-Ray comes with both the 2D and 3D versions of the film. If you have the set-up for 3D, that's definitely the way to go. The cinematography is breathtaking, with the extra dimension giving you the sensation of getting up close to the lemurs. As with most documentaries made for IMAX, Island of Lemurs: Madagascar is only 40 minutes long, so there isn't a ton of depth; the movie is a nice overview, at best. But it's a fun overview for the whole family – one that may inspire you to learn more. A number of bonus goodies come on the disc, specifically a handful of short segments that expand on what's presented in the main feature. One of them is a 5-minute making-of, and another looks at some of the mysteries of how lemurs first arrived on Madagascar. Patricia Wright gets some expanded time in a section devoted to her work, and you'll learn how a scene involving children on go-karts was accomplished. Picture and sound quality on the Blu-Ray are outstanding. 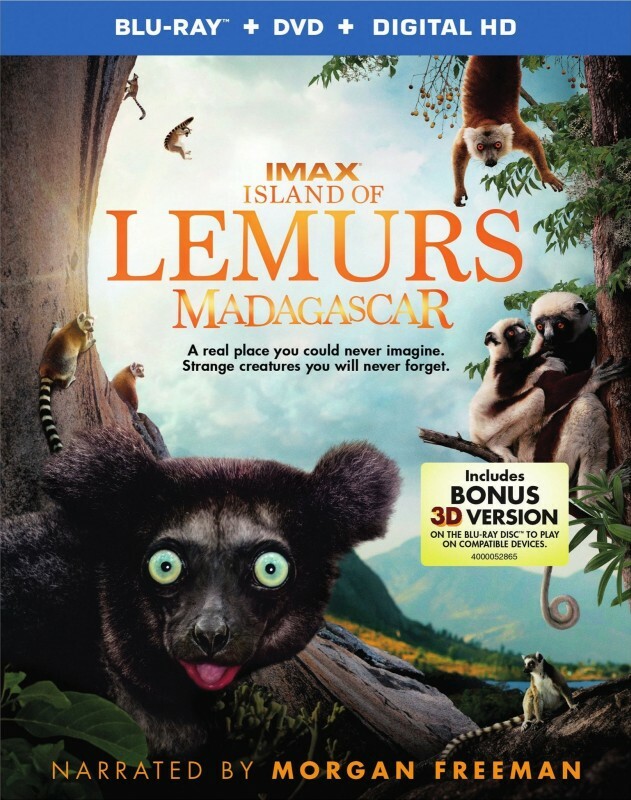 Island of Lemurs: Madagascar is rated G. The running time is 40 minutes.